Pennsylvania lawmakers are giving ‘texting behind the wheel’ the red light. After years of studies and debates concerning texting while driving, Pennsylvania Governor Tom Corbett is projected to sign a proposed bill that will make it illegal to combine the two any longer. Under the new law, police officers would be able to pull over any motorist that they suspect of text messaging. 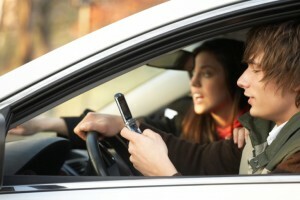 Being a primary offense, texting while driving may be the only violation needed to be pulled over, instead of the prior slap-on-the-wrist approach when violators of other laws are suspected of texting. The State Senate has voted to pass the bill, 45 – 5. If approved and enforced, this bill would be effective in March. Violators would face a $50 fine. “If they (police officers) want to make people conscious of it, a fine is acceptable, but if they really want to stop it, they need to put points on your license, like with a speeding ticket,” said Diane Bounds, librarian of Penn Manor High School. Bounds believes that Bluetooth devices should be available to those motorists who heavily rely on constant communication as a part of their occupation. In an effort to reform the safety and well being of Pennsylvania’s motorists, officials have been counting on this bill to be put into effect. The proposal of this bill has been a slow process, with Pennsylvania lawmakers taking years to get to the present state. “This bill will be a welcome addition to motorist regulations. It will eliminate another major factor of accidents and give drivers peace of mind,” said high school motorist Derek Harzinski. According to a study performed by Edgar Snyder and Associates, for every six seconds of drive time while simultaneously text messaging, 4.6 of those seconds are spent with the motorists’ eyes not on the road, a hefty 77 percent. This risk is greatly magnified for truck drivers while text messaging, leaving them to be 23.2 times more likely to get into an accident than a trucker paying full attention to the road. “We can’t continue to play ping-pong with the House on this issue,” said an anonymous Pennsylvania representative. However, not all folks support this proposed ban. Some believe that this law would infringe upon personal liberties. These people think that if a motorist is driving without paying attention to the road, and is texting, then they should be charged just the same as someone who is alert and attentive. Other people believe that if texting behind the wheel is outlawed, folks will be more inclined to keep their phones below window level and out of sight of police officers. The problem with this possible outcome is that the lower in the car a person’s phone is while they are texting, the further their eyes have to travel from the road. If this were not banned, motorists could legally text with their phones on or above their steering wheel. This would, in theory, create a more safe scenario than its sneaky, lap-level counterpart. It is now up to Governor Tom Corbett to either make or break this much anticipated addition to motorist safety in Pennsylvania.